Set a graceful event table using these baroque picture frames and your guests will feel like royalty! These will have so many uses - do your own photo inserts, placecards, print some poetry for your guests to read aloud - the possibilities are endless. 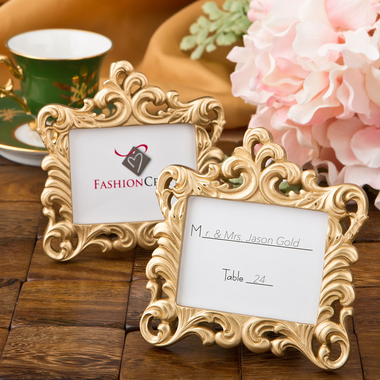 Each fancy mini frame measures 3.75"W x 3.75"H and has an insert area measuring 2" x 2 5/8". They are constructed of poly-resin and finished in a brilliant gold. They are easy to do your own inserts with the tab opening on the back of the frame where the easel is attached and come with a blank placecard. They will come individually packaged in a plain white box.